The name David Ives conjures memories of his first huge hit, All in the Timing, which was, but for Shakespeare’s plays, the most produced play in the country in 1995-96. Likewise, in the 2013-14 season, productions of Ives’ Venus in Fur also came second only to productions of Shakespeare. And speaking of Shakespeare, Ives has created much of his remarkably successful career by translating, adapting, rescuing, re-tooling, or—and he says this himself—respectfully ripping off the tales and ideas of other authors (duly cited, of course). So it should come as no surprise that Ives’ play The Liar is an adaptation of a classic comedy from 1643 by Pierre Corneille (itself based on a Spanish play of apparently deserved obscurity). For the most part, we come to Ives seeking hilarity. The Liar, a French farce beautifully directed by Penny Metropulos and performed by a stellar cast, does not disappoint. Ives retains Corneille’s verse form and provides laughter in every line. Far from becoming tedious, the verse only augments the fun—especially when Ives twists syllables to rhyme, or adds in enough anachronisms to keep the language zany and surprising. The cast, for its part, enables one to forget about the verse within minutes, except when the playwright wants us to notice it. Of course, The Liar concerns, well, a liar. Its main character, Dorante (the skilled and unexpectedly sweet Aaron Krohn) spins lie after lie as his very mode of being. Whenever he’s in a tight spot, or when simply making conversation, the most elaborate, overblown fictions spring from his imagination. For instance, when wishing to impress a friend, Alcippe (the very funny Philippe Bowgen), with his amorous triumphs, Dorante describes his night with a certain lady with outrageous and delightful double entendres. Amidst the verbal riches we all—except Alcippe—may forget that the latter is engaged to the lady. Indeed one beauty of The Liar is that Dorante’s extravagant stories keep us from growing weary with the plot of unmasking a truth we already know. Another beauty is that the women, far from being ornamental objects of the men’s desire, are, if anything, wittier, cleverer, and more determined in their goals than are the men. As Lucrece, the initially quiet friend of the more garrulous and showy beauty Clarice, Monique Barbee has arguably the more difficult role and plays Lucrece with sensitivity and grace. As Clarice, Kate MacCluggage’s charisma derives from her palpable joy in acting and her expert fun with the language (MacCluggage was marvelous as a witch in the Long Wharf/Hartford Stage production of Bell, Book, and Candle in 2012). 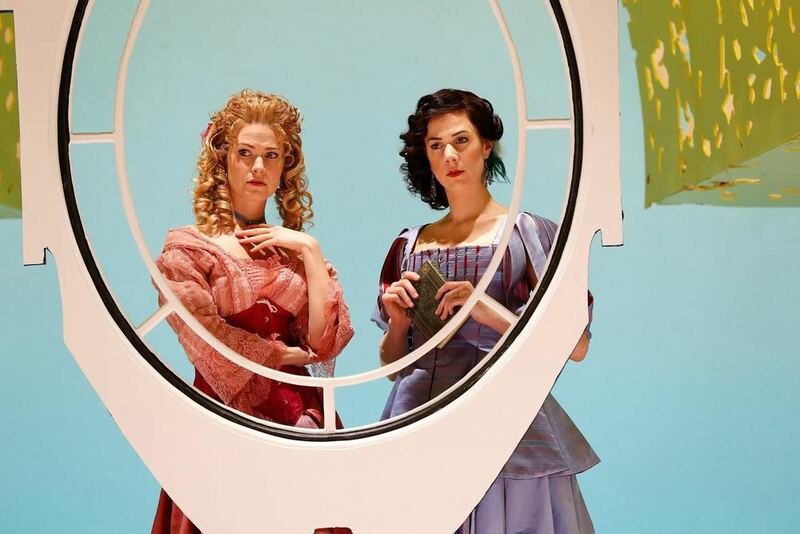 Also expert is Rebekah Brockman, who gave us such a poignant Thomasina in the Yale Repertory Theatre's Arcadia this past fall. Brockman plays identical twin ladies’ maids: Isabelle, sensual, and Sabine, sanctimonious (and especially quick with a hard slap). The object of Isabelle’s desire and Sabine’s scorn is Cliton, Dorante’s hapless servant (Rusty Ross), as compulsively honest as Dorante is compulsively mendacious. Completing the cast is Brian Reddy, very funny as Dorante’s father, and Jay Russell as Philiste, friend and advisor to the hotheaded Alcippe. Matching the wit of the script and the sparkle of the cast is a set design by Kristen Robinson that is at once very French, very modern, and delicious to look at: the light green trees put one in mind of pistachio sorbet. The furnishings—black and white, spare and elegant—make for precisely choreographed set changes performed by the cast to French music (designed by David Budries) that sounds like a mix of hip-hop and 1980’s electronic dance tunes. The lighting design (Matthew Richards) heightens our sense of a disco-inflected present. And Jessica Ford’s costumes—as crazily beautiful for the men as they are for the women—complete our transportation to a colorfully unreal world. On several occasions, characters break the fourth wall to address the audience, making us complicit in their acts of lying. In one of these memorable addresses, Dorante even dips into the subject of existential despair, dodging out of it with a comforting lightness of touch. Certainly, The Liar can be enjoyed as simple, silly farce, but the philosophical questions the play elicits make it a comedic and ironic meditation on the truth, and so very French. Dorante (read Ives via Corneille) deeply understands not only the necessity of lies as we construct the facets of our social selves, but also the more profound ways in which lies make life not only pleasurable, but bearable.